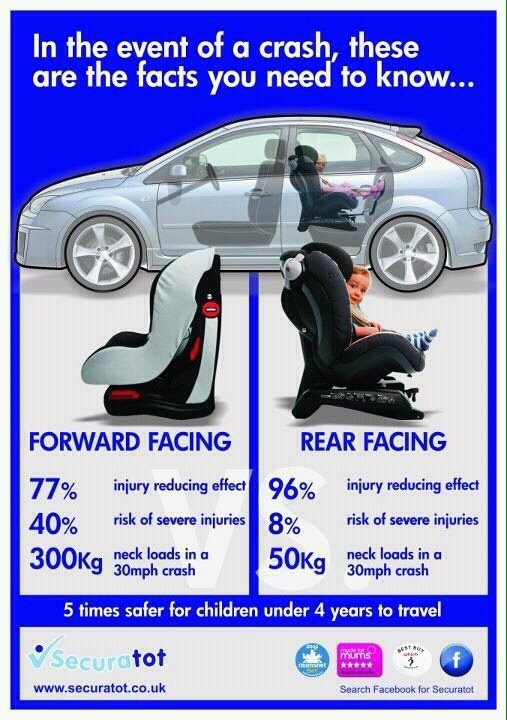 Did you know that it’s five times safer for a child to be rear facing? Scandinavian children are rear facing until they are 4–5 years old (25kg or 55lbs), which has resulted in a much lower number of children injured or dead in car accidents compared with other countries, as for instance the UK. Car safety is extremely important to me. It is dangerous enough on the road for adults but for children it is worse. Children rely on us to keep them safe and so I have to admit that I am a bit obsessed with making sure that baby boy has the safest car seat I can get him. When researching which infant carrier to buy I came across a lot of information online about keeping children rear facing until they are at least 4 years old. I had never heard about this before. I just assumed that once they outgrew the infant carrier they went into a forward facing car seat. I delved a bit deeper and the research that I found shocked me. Take a look at this video. It clearly demonstrates the force that a child is subjected to in a collision. In a front facing car seat that force is centred on the neck and shoulders. The video shows how that force is spread over a wider area of the body in a rear facing car seat. If the child’s seat is rear facing, the shell of the chair will form a protective shield and absorb the shock. Crash tests show that compared to forward facing seats, the pressure exerted on the neck is 5 times lower for rear facing child car seats. These are the reasons why all baby seats (group 0+) are only designed for rear facing use. After I watched the video it suddenly seemed like common sense to me. It made me determined to keep baby boy in a rear facing car seat for as long as possible. Now baby boy still has plenty of room in his infant carrier so we don’t need to buy his next seat just yet. However, once I get my mind set on something I find it difficult to let go. Therefore I have already done a lot of research into which car seat I will buy and I think that I have decided on the Besafe izi combi. Coming to this decision was fairly difficult though. Although there is a fair amount of information about the benefit of extended rear facing, there don’t seem to be many places that sell these car seats. It seems that you can’t really just walk into a high street retailer and buy one of these seats. The majority are sold online. The two online retailers that I found particularly good were www.besafe.com and www.securatot.co.uk. These sites had a lot of useful information as well as selling seats. Another issue is the price of extended rear facing seats. I have to admit that they are a lot more expensive than most forward facing ones. If I’m entirely honest we can’t really afford one but I am determined that baby boy is going to have an extended rear facing car seat even if it means me going without! I have had some negative comments about my choice to be honest. When I have told people which car seat I want some people have said to me things like “why don’t you just buy a forward facing one, they are cheaper” and “surely you want him to face forward so he can see better”. My reply is always the same – I want my child to be safe. Some people have even said that baby boy will have to face forward if he travels in their car, as if my decision doesn’t matter to them! Now I’m not trying to convert everyone to rear facing car seats or be preachy. All I hope is that people will choose to research the benefits and make an informed decision when it comes to buying a car seat for their child. Will you be using an extended rear facing car seat? « Germs – causing havoc! You can extended rear face without buying an expensive seat. Most convertible seats these days can rear face til around 3 yrs old. Longer if you have smaller kids. My 4 yr olds only outgrew the rear facing limits of my regular old convertible car seats around 3.5yrs old. I kept them rear facing until 2. I turned them at 2 because I mis interpreted the height limit and thought they passed it. It’s a good compromise! Thanks for your comment. Unfortunately here in the UK most car seats will only rear face until 9 kilos. There are a few that will go until 13 kilos but if we want to keep rear facing for longer then we have to buy a specialist seat. This was really informative, especially since my niece is having a baby in January and we are shopping around for the baby shower now. A rear facing seat seems like a safer and smarter choice. Thank you. Rear facing seats are definitely safer up to at least age 4 if possible. I paid more for the seat but I don’t care if it means that baby boy is safer when we travel in the car. very interesting. really need to consider this alternative. No problem. Thank you for taking the time to read my posts. It is definitely a good option if you decide to go for it.